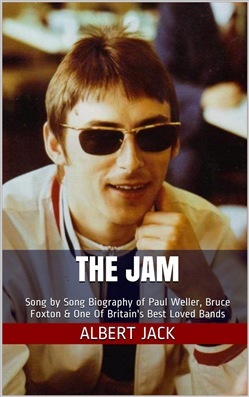 FOREWORD Plenty has been written about The Jam over the years, some of it has been true, and some of it I didn’t recognise at all when I read it. When Albert told me earlier in the summer he was going to write a biography of the band I was surprised as I didn’t think there was much more to add to what has already been written. But in this case he seems to have found plenty more, some of it I had even forgotten myself. In the past when I have been interviewed I have always partly regretted it afterwards as much of what I say gets edited or used in a context other than I would have liked it to be. In this case, however, Graham has stuck to the facts and told the story of The Jam how it actually happened, certainly how I remember it. On occasions I have been surprised at how detailed some of those facts are but in every case things are pretty much how I remember them. But that shouldn’t be too surprising as he is a Woking Jam fan. He saw the band play live on countless occasions and was at places like the YMCA and The Cricketers, when we played those small gigs in the 80’s, so a lot of what he has written is from first hand experience, not research. Over the years the attention for many has always focused on The Jam’s ‘acrimonious split’ or ‘bitterness’ between myself Paul and Rick, but nothing could be further from the truth. The Jam didn’t break up badly at all. And as for the bitterness - we were young when we started, schoolkids in fact, we grew up together, made some pretty decent music, saw the world and had the time of our lives. That’s nothing to be bitter about at all and none of us are. The level of interest there still is in The Jam always pleasantly surprises me. It is, after all, over 20 years ago now. It must mean the three of us did something right together and that is something to be very proud of. The Jam were mainly known as a ‘singles band’ and as a result all the best of compilations have focussed only on the very well known songs, but hopefully after you have read this book you might go and pick up a couple of the albums and discover some of lesser known track’s, or perhaps some of those hidden away on b-sides that you haven’t heard before. I think you could be in for a few surprises. I hope you enjoy reading the story of The Jam and taking a look behind the scenes, so to speak. Thanks for continuing to make it all so worthwhile. Bruce Foxton – Guildford September 2003. Acquista The Jam: Sounds From The Street in Epub: dopo aver letto l’ebook The Jam: Sounds From The Street di Albert Jack ti invitiamo a lasciarci una Recensione qui sotto: sarà utile agli utenti che non abbiano ancora letto questo libro e che vogliano avere delle opinioni altrui. L’opinione su di un libro è molto soggettiva e per questo leggere eventuali recensioni negative non ci dovrà frenare dall’acquisto, anzi dovrà spingerci ad acquistare il libro in fretta per poter dire la nostra ed eventualmente smentire quanto commentato da altri, contribuendo ad arricchire più possibile i commenti e dare sempre più spunti di confronto al pubblico online.